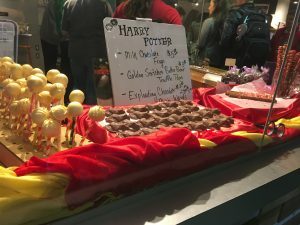 Every year, Chestnut Hill hosts a Harry Potter Festival. 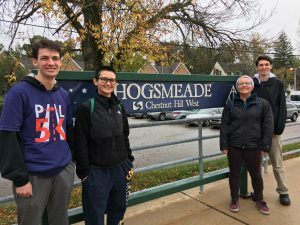 Last Saturday, October 22nd, us SEPTAdventurers took the Hogwarts Express (actually a local train) and headed over to Chestnut Hill for the festivities! 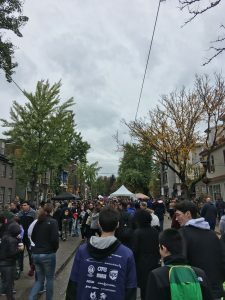 Though the weather was dreary, there was an incredible turnout of witches, sorcerers, Gryffindogs, muggles, and wizards! Germantown Avenue was packed with the like, enjoying butter beer and chocolate frogs. Tents were strewn along the cobblestone street. My favorites offered writing letters for Hedwig on a typewriter, making your own golden snitch, and a slow motion camera where you could fight a dementor and watch your wizarding skills (which are always funnier in slow motion). We were also greeted by Dumbledore himself at the start of the day! Does J.K. Rowling know that he’s still alive?? After a quick trip by broomstick, we saw the quidditch matches at Chestnut Hill College. I had no idea that my university, Drexel, had a quidditch team! The roster featured teams from Drexel, Lafayette, Stockton, Pittsburgh, Franklin and Marshall, Syracuse, Chestnut Hill College, and Kutztown University. Nothing feels more Harry Potter-esque than watching a match of quidditch! We had a great time at the Chestnut Hill Harry Potter fest! Please do yourself a favor and go next year! There are plenty events for all age groups (including a pub crawl for our friends over the age of 21!). Also please join us on our next SEPTAdvenuture in November! Details will be posted on the SEPTA YAC Facebook page as well as the SEPTA YAC website! See you next month and happy SEPTAdventuring!